Did you know you are free? You are free to make any choice you want to. No one can make you choose. Our wills determine our choices. If you are stuck in a bad habit, you may feel like you have no choice but to keep doing what you have been doing…but that is a lie. God designed us to be free. And God allows us to make our own choices, even when He knows they aren’t the wisest or how we will be hurt by them. Why would such a loving God allow us to do so? 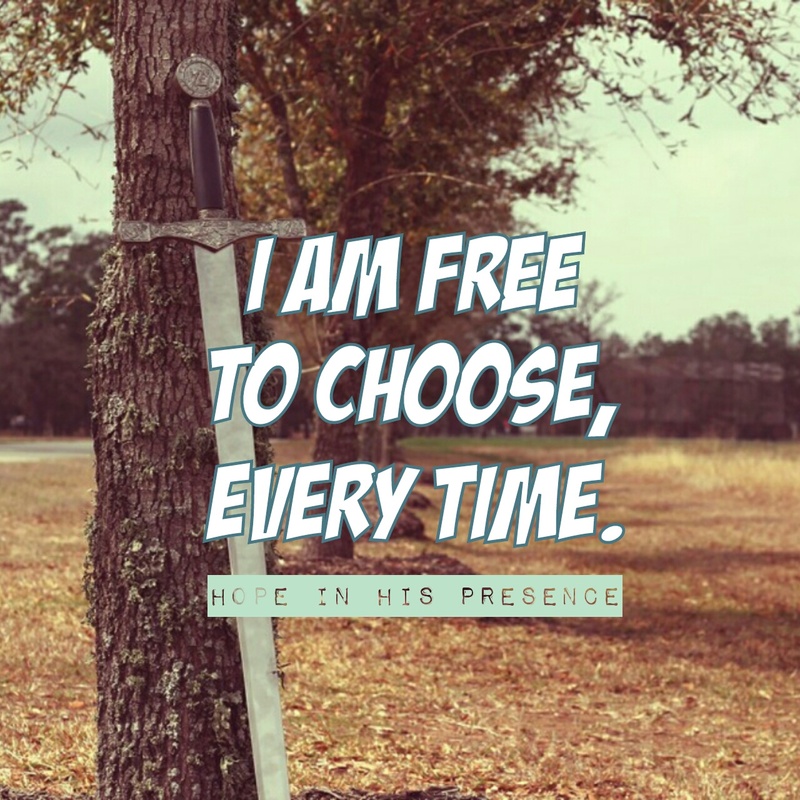 Because He wants us to freely choose His way, just as Jesus did. Do you grasp that Jesus CHOSE the cross? He freely agreed to follow through, despite the devastating pain & separation from His Abba & Holy Spirit when He took on all our sin? As we are made in His image, we too are designed to be free to choose. We are free to say yes, and likewise no. This may seem childish and simplistic a concept to some of you, and I bless you in the level of freedom you are walking in. Some of us are not that free yet. I have the tendency to bottle my emotions when I am upset…and this shows up in eating past my hunger cues. I have not always has this extra weight issue. There have been periods where I am healthier, and my appetite is based on real physical hunger desires, versus when I fall off the wagon and eat based on my emotional hungers not being addressed properly. I am free to choose to eat well, or not. But my choice, either way, comes with consequences. Over eat? Overweight. Eat healthy? Healthier temple. This is just one example of how we are free to choose. We are free to say no to good things too, when we want to say yes to the best choice for us. I left a job I loved because God was calling me into a new direction. I was both free to follow, and free to stay. The choice to obey His call? Up to me. Your choice in a single moment has future impact. Choosing God, means your future will not end once we leave this earth, nor will it be the same while you live out the rest of your days. Choosing Him of our free will invites Him to release the fullness of His freedom within us, stirring us up to answer its call. Choosing His way means we allow Him to direct our path, as only He knows the way ahead, and if we are listening closely, we will avoid pitfalls and distractions along the path. We are always free to agree, or not. If there is an area of your life you want to bring into alignment with the freedom He has for us, ask Him to shine His light on it, and break you free from the unhealthy consequences you have been dealing with. Especially our mindsets, emotions & spirits. For when we freely agree with something that isn’t healthy for us, we are impacted by those choices. You may think or feel unhealthily, such as hearing ‘You’ll always be so pudgy’ randomly run through your mind or feeling yucky when you catch a glimpse of yourself in the mirror, while trying on clothes. Your spirit may be wrestling to break free from the chains of your choices as well, for it knows when we choose well or badly, for it is eternal and always trying to commune with its Creator. 1. If you know you are bound by a bad choice, you are free to run to your Abba and ask Him to break the chains binding you. Always. 2. If you have a bad mindset about yourself (stupid, lazy, ugly…) ask your Abba to remind you who you are to Him. Write down what He tells you. Read it over every time an old name pops up. Choose to be free from the negative mindset of your past. 3. If your emotions are driving your decisions, its time to ask God to move into the driver’s seat, and filter all your decisions through His love and best for you. You are always free to put God on the throne of your life. 4. If you know you need help to break free to be the you He designed, run for it. Don’t hesitate. Today could be the day you are set free! You are always free to ask for help, for we were meant to be in community. To seek support when we need it, to offer help when others need what only we can give. 5. Remember you are free to choose in every decision you make. You are always free to ask God His opinion, and free to choose to wait for His response. These past seven days, I have been working through this freedom especially in regards to my eating, which is really about my emotions. I believe I am free to eat whatever I want whenever I am hungry. I am also free to say no when I am not, and to stop when I am full. I am very thankful to Beth Kinder & Sandi Krakowski for their wise Spirit led input into stepping fully into the freedom God has waiting for me as I freely choose His way, every day! I am free not to live for anyone else but You! Help me walk that out each and every today I have with You, Lord.